Evaluated as espresso. Richly sweet, chocolate-toned. Dark chocolate, gardenia-like flowers, green apple, gently scorched cedar, hazelnut in aroma and small cup. Satiny-smooth mouthfeel; richly drying finish with notes of green apple and cedar. In cappuccino-sized milk, green apple and rich nut butter are supported by spicy-sweet gardenia-like flowers and a hint of smoky cedar. 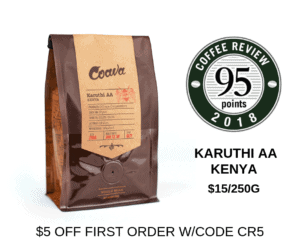 This blend is composed of three different 100% Thai single-origin Arabica coffees with varying roast profiles. Bluekoff is a Thai company involved in all aspects of coffee, from milling and roasting to coffee wholesale and retail and related equipment and training services. Bluekoff produces more than 1,200 tons of green coffee and 1,000 tons of roasted coffee per year.Visit www.bluekoff.com or call +66-81-751-1217 for more information. The Bottom Line: A floral-toned, chocolaty espresso blend of three Thai-grown coffees, roasted to foreground engaging aromatic wood notes.